Its semifinals time on Airtel Super Singer Junior 2 and the treat is on. 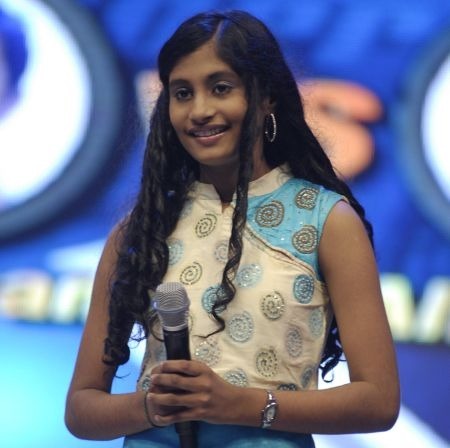 The first leg of the semifinals saw the exit of Srinisha. But all is not lost for her as she stands a chance to enter the finals along and through the wildcard round. The remaining talents of Alka, Nithyashree, Roshan and Shravan would now proceed to the second leg of the semifinal.So far the kids’ have been put to task on various genres of singing. They have had their moments singing before the renowned Judges like Mano, Chithra and Malgudi Shubha. The juniors have also been graced by the presence of legends from the Tamil music industry like P.B.Srinivasan, M.S.Viswanathan, L.R.Easwari, P.Suseela, S. Janaki and many others. In the coming week of semifinals the kids’ would be singing in a one-on-one format. Every contestant would be made to sing against each other. They would take on the challenge against each other and would be singing on various genres like classical, melody and western styles. To cheer up the kids’ performances, celebrity Judges like Nithyashree, Harish Ragavendra and Suchithra would also be made to sing along with the kids’. Tune into watch your favorite kid perform in the semifinals round of Airtel Super Singer Junior 2 from May 10 – 13, 2010, Monday – Thursday, 9pm on Vijay TV.